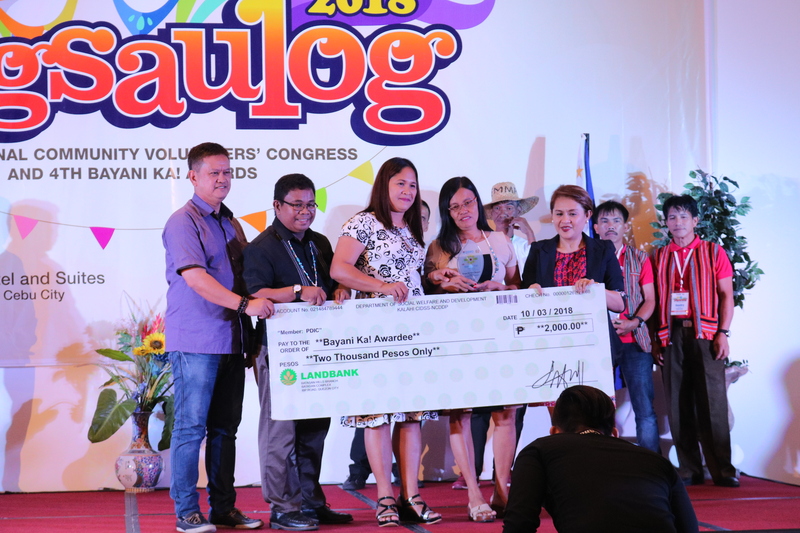 Malate, Manila—The 2nd National Community Volunteers’ Congress and 4th National Bayani Ka Awards was successfully conducted last October 2-4, 2018 in Cebu City. It was attended by at least 260 community volunteers of DSWD Kalahi-CIDSS and Local Government Unit (LGU) officials from across the country. The event’s theme is “Pagsaulog” a Visayan word which means festivity or celebration. This occasion celebrated the the noteworthy contribution of the Community Volunteers towards the success of the Kalahi-CIDSS program. More so, the occasion hailed the exemplary Kalahi-CIDSS Operation and Maintenance (O&M) groups that were awarded as “Bayani” during each region’s Regional Bayani Ka! Awards. These groups were awarded the prestigious Bayani Ka Award because of their remarkable ways of mobilizing their communities towards a collective community action. The participants were welcomed by DSWD Field Office 7 Assistant Regional Director for Operations (ARDO) Shalaine Lucero. ARDO Lucero mentioned in her speech the importance of the Community Volunteers in Kalahi-CIDSS. “Walang Kalahi-CIDSS kung wala ang mga masisipag na community volunteers” [There is no Kalahi-CIDSS without the industrious Community Volunteers]. ARDO Shalaine’s speech was followed by the presentation of the current state of the Kalahi-CIDSS program by the National Monitoring and Evaluation Specialist Miss Abegail dela Cruz. This presentation was proceeded with the Communication Specialist Miss Maria Rosario Lagman’s presentation of the current status of Volunteerism in the Philippines. To conclude the first day of the activity, the participants were pampered with free massage and free nail care services courtesy of DSWD Field Office 7. On the second day, the delegates were divided into three groups to visit the municipalities of Moalboal, Pinamungajan, and Dalaguete in Cebu. The field visit was conducted to serve as an avenue of exchange of knowledge between the community volunteers from the three visited Kalahi-CIDSS municipalities and the delegates of the National Community Volunteers’ Congress. While the volunteers were on immersion, the LGU officials had an executive meeting with the Municipal Inter-Agency Committee of their visited municipalities. They shared their ideas and strategies on how Community-Driven Development (CDD) could be institutionalized in their respective municipalities. The volunteers had sessions where they shared their knowledge on their project implementation techniques. They also had discussions about the opportunities given to them because of their involvement with the Kalahi-CIDSS program. Before returning to Cebu City to complete their field visit, the participants went to different sub-project sites in their visited municipalities. On the last day of the activity, the participants had an open forum on their field immersion with the Community Volunteers from Cebu. The participants shared their learning and their insights. They also committed to share these learning and insights to their co-volunteers once they return to their communities. Beneficiaries from Ferrol, Looc, Odiongan, and San Andres, Romblon line-up to get their UCT grants. ODIONGAN, Romblon- A total of 1,139 beneficiaries in four towns of Romblon received cash grants amounting to 2,400.00 each as an aid from the government under the Department of Social Welfare and Development (DSWD) Unconditional Cash Transfer (UCT) Program. The payout in coordination with Landbank of the Philippines (LBP)- Odiongan branch held in Romblon State University covered court on September 22, 2018, DSWD has disbursed a total of P2,733,600.00 disbursed for 267 beneficiaries in Looc; 104 in Ferrol; 174 in San Andres; and 594 in Odiongan. “From the 1,570 target beneficiaries identified poor in Listahanan database, only 72.5% was able to claim their grants,” DSWD MIMAROPA OIC Policy and Plans Division Chief Editha B. Ocampo said. The DSWD official said that some of the beneficiaries failed to bring complete documents during the release and cases of no-show beneficiaries. A new schedule will be set for those unclaimed grants. Earlier this month, DSWD spearheaded the notification and registration of beneficiaries in the said towns as the pilot area in the province, prior to the payout which was initially scheduled on September 15, 2018. However, it was postponed due to Typhoon Ompong. 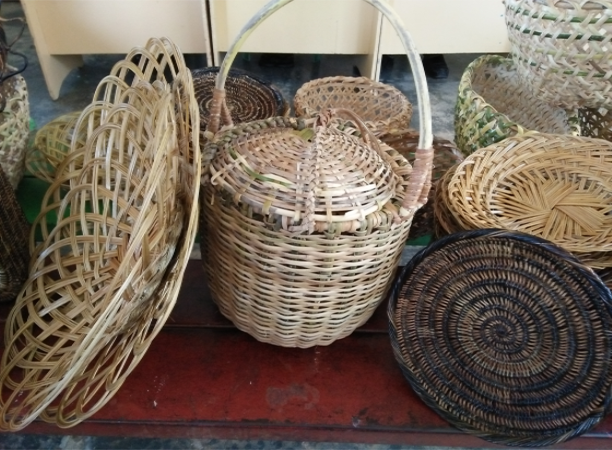 “We recognize the support of our partner Romblon local government units down to the barangay level for the UCT program implementation,” Ocampo added. On the other hand, UCT payout in other towns will be scheduled in the following months either off-site release or through LBP conduits. Local officials in Brooke’s Point (L) and Rizal (R) receive the list of the poor households stored and encrypted in Compact Disc from Listahanan Regional Coordinator Ernie Jarabejo. PALAWAN- The municipalities of Rizal and Brooke’s Point received the list of poor households from Listahanan of the Department of Social Welfare and Development (DSWD) MIMAROPA as part of the data sharing agreements. These local government units have complied with all provisions in the DSWD data sharing guidelines, a mechanism to safeguard the information of poor households in compliance with the Data Privacy Act of 2012, an act that protects individual personal and personal sensitive information. This data sharing aims to establish a systematic way of sharing data and information of poor households as a basis for selecting potential beneficiaries of various local social protection programs. Pasig City, Metro Manila- The Local Chief Executives of the town of Araceli, Cagayancillo, and Magsaysay, Palawan; Banton, Calatrava, and Looc, Romblon; Gloria, Oriental Mindoro; and Sablayan Occidental Mindoro attended the DSWD Kalahi CIDSS MIMAROPA’s Pre-Engagement Consultation Workshop with the Local Government Units on Thematic Community-Driven Developmet (CDD) Pilot Project Implementation last July 17-19, 2018 at the Linden Suites in Ortigas Center, Pasig City. The Thematic CDD is a new pilot project of DSWD Kalahi CIDSS wherein the LGUs will select a concept based on their development plans in which they will incorporate the process of CDD to the chosen theme that they will implement. Hon. Noel Beronio of Araceli, Palawan, Hon. Rommel Dela Torre of Magsaysay, Palawan, Hon. Joseph Fadri of Banton Romblon, Hon. Marieta Babera of Calatrava, Romblon; Hon. Leila Arboleda of Looc, Romblon; Hon. German ROdegerio of Gloria, Oriental Mindoro; and Hon. Eduardo Gadiano of Sablayan Occidental Mindoro attended the said activity together with their LGU delegations which consist of Sangguniang Bayan member for Appropriations, Association of Barangay Captain President, Municipal Planning and Development Coordinator, Municipal Social Welfare and Development Officer, and the Municipal Area Coordinator. The three-day activity provided a comprehensive orientation on Thematic CDD and has also discussed and aswered the queries and concerns of the LGUs regarding its implementation of the Thematic CDD and the concepts selected by LGUs to implement in their municipalities. ves the possible concepts that they will implement in their town. discussed and provided his expert inputs on community based eco-tourism and sustainable livelihood. More so, Miss Jing Ocampo from Compassion International and Mr. Marvin Trillana, Community Infrastructure Officer of Palawan Cluster, discussed and shared their expertise on Disaster Risk Reduction and Management. The concepts presented by the LGU were yet to be approved by the National Program Management Office of Kalahi CIDSS. After the presentation of the concepts, the LGUs signed their commitment to a more inclusive and participatory local governance through the used of Kalahi CIDSS’ CDD strategy. Community-Driven Development is a strategy used by DSWD Kalahi CIDSS to ensure that the development priorities of a community are addressed in an inclusive, participatory, collective, and demand driven way. This is done through localized decision-making during social preparation activities and in the identification, development, prioritization, establishment, and operationalization of community projects. This strategy aims to empower the community, reduce local poverty, and promote good local governance. It also encourages volunteerism and bayanihan by encouraging people to get involved and work hand-in-hand with their LGUs towards the development of their community. Through time since its inception, DSWD Kalahi CIDSS MIMAROPA encourages local government units in the MIMAROPA region to adopt/institutionalize the CDD strategy in their governance strategy. 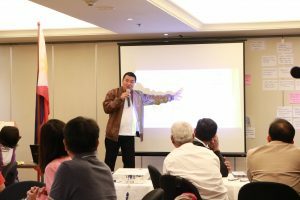 Pasig City, Metro Manila- Technical Working Group (TWG) who will serve as guide to the Local Government Units on the implementation of Thematic (Community-Driven Development) CDD pilot project are gathered last July 16-17, 2018 at the Linden Suites to discuss how Thematic CDD will be implemented and how the team can fully provide technical support to the LGUs in the implementation of this pilot project. Area Coordinators, Municipal Financial Analyst, and Technical Facilitator comprised the TWG. On the two-day activity, the Regional Program Management Office of DSWD Kalahi CIDSS discussed with the TWG the Thematic CDD and their roles in its implementation and the DSWD promotive programs directives. 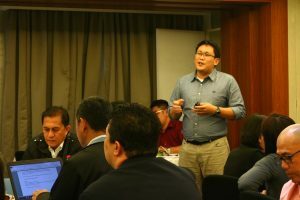 The TWG discussed the challenges they faced on their previous implementation of Kalahi CIDSS NCDDP and how they can improve/prevent these challenges in the LGUs’ implementation of Thematic CDD. Moreover, the TWG crafted their workplan on the Thematic CDD implementation. Romblon provincial government officials received the copy of Listahanan database. (L-R) Evaluation Officer Cynthia Fetalino, Listahanan Coordinator Ernie Jarabejo, Governor Eduardo Firmalo, Executive Assistant Louie Firmalo, Provincial Social Welfare Officer Vilma Fos, and Listahanan Statistician Jennel Maquiñana. ODIONGAN- Romblon Governor Eduardo Firmalo received the Listahanan list of identified poor households in this province from Department of Social Welfare and Development (DSWD) MIMAROPA on Tuesday, July 10, 2018. Romblon is the first recipient among the five provincial governments regionwide of the said Listahanan database. Listahanan is a mechanism that identifies who and where the poor are. In Romblon, 20,777 poor households are identified as poor according to the 2015 household assessment. The data sharing aims to establish a systematic way of sharing data and information of poor households as a basis for selecting potential beneficiaries of various local social protection programs. “Now that we have the database from the National Household Targeting System for Poverty Reduction now Listahanan, we have the baseline data that can be used in our programs intended for the poor,” said Governor Firmalo. The provincial government of Romblon has won the DSWD Gawad Listahanan in 2014 and 2015, an award that is given to local government units recognizing their efforts in the implementation of local social protection programs using Listahanan list of poor. Listahanan result was used as a reference for the HEART program which focuses on Health, Education, Agriculture, Revenues, Resource Generation, Tourism and Transparency to combat the effects of poverty in the province of Romblon. “Because of this [Listahanan] data, we are guided for our targets since 2011, and that’s a big accomplishment of the provincial government,” added Firmalo. The governor also is hopeful for the positive results as the new list is of poor in the province is revealed so that proper interventions will be implemented to uplift their well-being.